"Atlantic City was Las Vegas. This town was wide open." "The breaks are everything. It's the roll of the dice, the flip of a coin, the cut of the cards, the turn of the wheel... You have to be in the right place at the right time." In her glory days  the pivotal decades from Prohibition to the Jet Age Atlantic City was the nation's center of popular entertainment. Celebrities and tourists flocked to "America's Playground" while political corruption, illegal gambling, bootlegging, and prostitution were all sanctioned as part of the Atlantic City experience. Two larger-than-life men  Enoch "Nucky" Johnson, with his political empire, and Paul "Skinny" D'Amato, super-smooth 500 Club owner  are legends of this era. Chance of a Lifetime explores the heyday of this resort - a time when real-life excesses strain even the wildest imaginations and outrageous characters made it all happen. Beginning with the early attractions of the resort island, then exploring the power base of boss "Nucky" Johnson, and later "Skinny" D'Amato and his famed 500 Club - a venue that encapsulated everything good, bad, and fun about the resort town - we are given a nostalgic tour of the "good-bad old days." It is the time and place where American Cool in was born in mid-century, it was the first home of the Rat Pack and a haven where a down-and-out Frank Sinatra was always welcome  and never forgot it. This intimate account of the city, the club and the famous and infamous people who passed through is told by insider Grace Anselmo D'Amato, whose husband managed the 500 Club for his brother Skinny. The book includes a foreword by the noted Atlantic City historian Vicki Gold Levi, who recounts her experiences as a teenager at the "Five" at its height in the '50s. 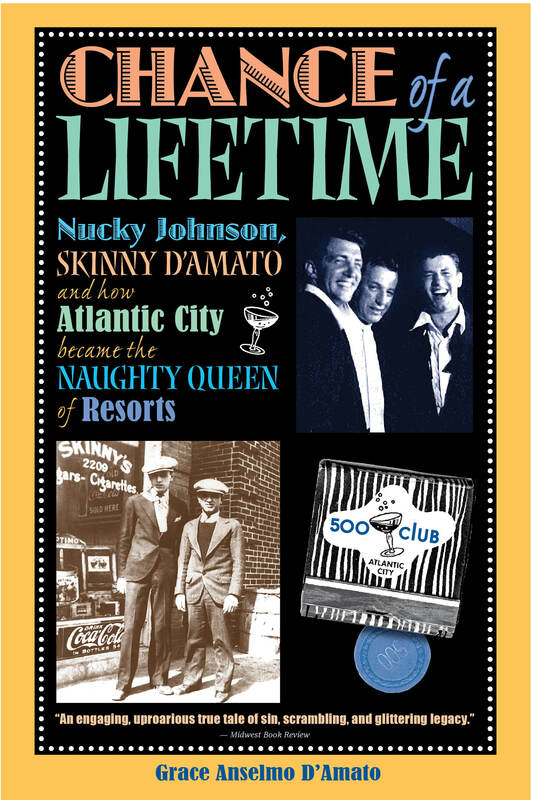 Chance of a Lifetime is extensively illustrated with 178 rare pictures of celebrities, Nucky Johnson, Skinny D'Amato, the 500 Club, and historic Atlantic City images on 96 gallery pages  with additional images throughout the text. In a place where more people came for sin than sun, Chance of a Lifetime details the rise and fall, and rise again, of Atlantic City's glorious glitz and guts. "A rollicking account... There were few in the city as flamboyant as Skinny D’Amato. The book chronicles his career from his start as a precocious street hustler to his time as the owner of a nationally known nightclub. At the peak of the 500 Club’s popularity, Skinny D’Amato was as much of a celebrity as Sinatra and the other entertainers who filled its showrooms nightly." "Evokes the sounds, smells, and sights of the day in a vivid and refreshing manner" "fleshing out the Damon Runonesque characters of the city’s history in detail." "Chance of A Lifetime rings true because it is a firsthand account. Grace Anselmo D’Amato takes us on an exhilarating ride through the extravagance, pathos, and optimism of Atlantic City’s rise, fall, and resurrection." " Among those depicted are Jackie Gleason, Sammy Davis Jr., Danny Thomas, Zsa Zsa Gabor and Milton Berle, as well as Martin & Lewis and, of course, Sinatra." Skinny had an eye for talent, and young entertainers were thrilled to be given an opportunity to perform at the 500 Club. This mutually beneficial situation resulted in Skinny offering his patrons unknown performers who later became nationally and internationally famous. In 1946, Skinny hired a scrawny, little-known comedian from New York. The man had worked the Borscht Belt in New York’s Catskill Mountains, but outside of that venue, the name Jerry Lewis didn’t mean much to many people. So Skinny paid him one hundred and fifty dollars a week. He also hired a velvet-voiced singer from Ohio. Dean Martin had established himself in nightclubs, so Skinny paid him seven hundred dollars a week. Martin was a carefree, easygoing man; Lewis was intense. The mother of three children and grandmother of five, the late Grace Anselmo D'Amato was a New Jersey native. She married Willie D'Amato in 1945, when she was eighteen and he was thirty-three.